Two Finnish special two-euro commemorative coins will be released in 2018. The theme of the special commemorative coin released in the spring will be National Landscapes of Finland and the autumn’s special coin will pay tribute to Finnish Sauna Culture. 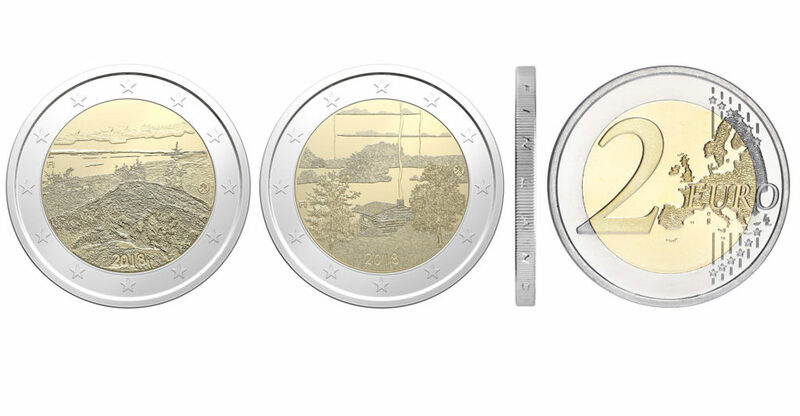 The launch of nine five-euro commemorative coins in honour of Finland’s National Landscapes is also in the works. Finland’s national landscapes symbolise the Finnish character and have a generally recognised significance in Finland’s national culture, history and perception of nature. The total mintage of the special two-euro commemorative coins paying tribute to Koli National Park in North Karelia will be one million. Mint of Finland is also planning a 2018 release of nine commemorative coins themed around Finland’s national landscapes. The nominal value of each base-metal commemorative coin will be five euros. The first special two-euro commemorative coin to be released in 2018 will share its theme of Koli with the opening coin in the series of five-euro National Landscapes of Finland coins. In the summer of 2017, Mint of Finland coordinated an online poll in which the Finns voted for nine of their most beloved national landscapes to be featured on the commemorative coins. Koli National Park received the most votes in the poll. The obverse of the National Landscapes of Finland Koli commemorative coin depicts the view from the summit of Koli, while the reverse bears an image of the map of Finland. The commemorative coin is designed by Erkki Vainio (obverse) and Mari Metso (reverse) on the basis of a photograph taken by Juha-Pekka Järvenpää. The maximum mintages of commemorative coins released in the National Landscapes of Finland series will be 3,000 proof-quality coins and 15,000 UNC-quality coins per release. The mintage of the Finnish Sauna Culture special two-euro commemorative coins released in the autumn of 2018 will be one million. The special commemorative coin is designed by Erkki Vainio. Special two-euro commemorative coins can be obtained as change in regular circulation or purchased from the Mint of Finland online shop and from retailers. Finland’s National Landscapes commemorative coins will be available from the Mint of Finland online shop and the mint’s retailers.